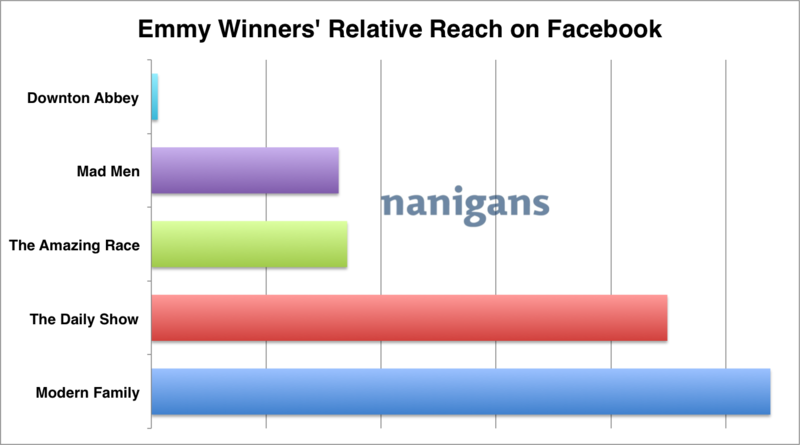 2011 Emmys Winners: Who’s Gold on Facebook? Did you catch the Emmys last night? The Academy of Television Arts and Sciences awarded their favorite actors, directors, producers and writers 2011at the 63rd annual Primetime Emmy Awards. On the series front, 2011 Emmy award winners include: The Amazing Race (best reality competition), The Daily Show (best variety, music or comedy), Downton Abbey (best miniseries or movie), Mad Men (best drama) and Modern Family (best comedy). 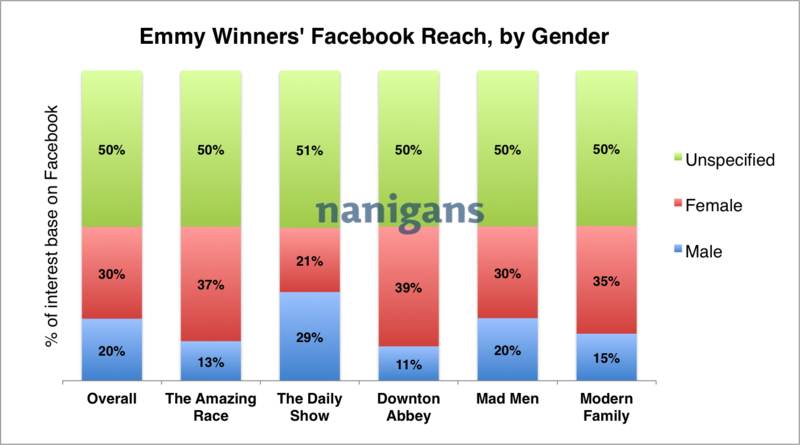 Modern Family and The Daily Show have the largest number of Facebook users citing interest in these shows on their profiles, with Modern Family enjoying three times the reach of The Amazing Race and Mad Men. Compared to these four shows, the British television series Downton Abbey has a tiny fraction of interest from American Facebook users. We pulled data to see if there was a larger interest base in the United Kingdom, and even including those British fans would not move the dial in comparison to the popularity of the other shows on Facebook. Modern Family and The Daily Show are more popular with younger Americans on Facebook, with both shows having over 60% of their interest base between the ages of 15-34. 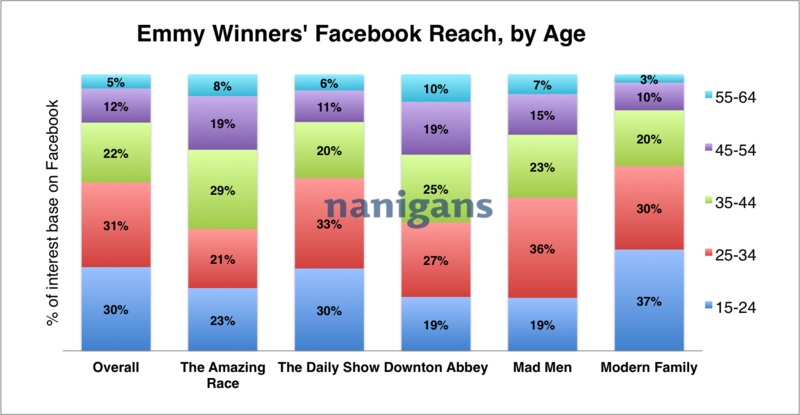 The Amazing Race and Downton Abbey, on the other hand, are more popular with older Americans, with 56% and 54% of their interest base on Facebook being 35 or older. Perhaps more dramatic than age differences across these five television shows are gender differences. Half of Facebook users who cite interest in these television shows don’t include gender information on their profile (these are “unspecified” in the graph above), but overall more females actively cite interest in these shows than males. The Amazing Race, Downton Abbey and Modern Family in particular resonate with females to a much greater degree than males. The only show with a greater proportion of males than females is The Daily Show. What surprises you about the data? Let us know in the comments!